The Pittsburgh Penguins tonight are playing their first home game since Saturday’s mass shooting at the Tree of Life Synagogue, where a gunman killed 11 people in what the Anti-Defamation League called the “deadliest attack on the Jewish community in the history of the United States.” The Penguins added a Star of David to their uniforms with the phrase “Stronger Than Hate” for tonight. And before the game began, they had an 11-second moment of silence for the victims along with an especially emotional performance of the national anthem. The ceremony was the proper amount of restrained, even if it did hit that unearned optimistic tone that all pregame tragedy-related ceremonies do. 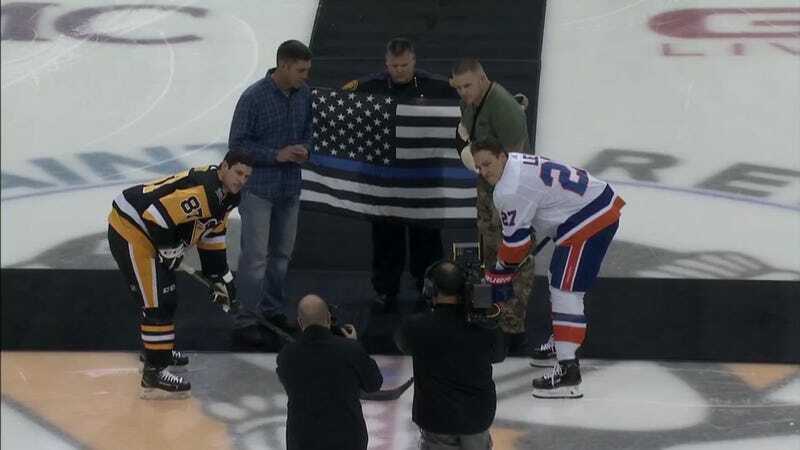 But besides the fact that everything the Penguins are doing to honor the victims feels completely insincere given that they pal around with a president who’s actively encouraged anti-Semitic conspiracy theories, and whose only solution to gun violence is “more guns,” there also was a pretty colossal miscalculation in the pregame ceremony itself by whomever allowed this “Blue Lives Matter” flag to receive prominent placement at the ceremonial puck drop. There are ways to honor the heroic first responders at the Tree of Life synagogue without emphasizing a rhetorical tool used to preserve the fucked up status quo. And while I’d love to give the Penguins some benefit of the doubt here, this franchise’s recent history tells us that they know exactly what they’re doing.